It's the first time people have ever seen this happen. Chimps use tools - we've known this since Jane Goodall discovered them using twigs to "fish" for termites in Gombe National Park in the 1960s. More recently, chimps in Uganda were documented using leaves or moss to soak up water so they could have a drink. 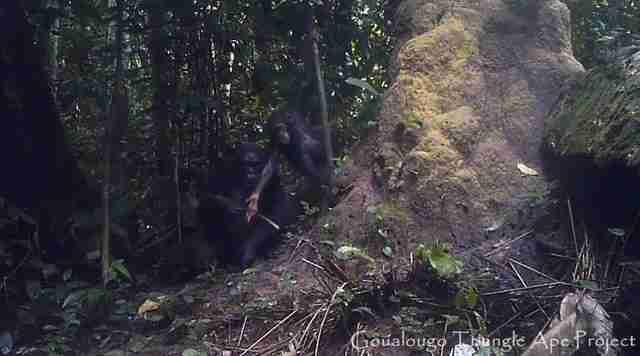 Now, in a newly released video, a chimp and her baby were filmed doing something scientists can't stop talking about. In the Nouabalé-Ndoki National Park in the Republic of Congo, a mother sits at the base of a termite mound and fashions a "fishing rod" by stripping the leaves from a twig. Instead of using the tool herself, she hands it to her baby. Only then does the mom make another one for herself. The baby chimp climbs higher up on the termite mound, and mimics his mom's "fishing" technique to get his own termite dinner. So what's so remarkable about this discovery? According to Stephanie Musgrave, the lead author of the study published in Scientific Reports, it's the first time wild chimpanzees have been documented teaching their offspring to use tools. "We've known for many years that chimpanzees are amazing tool users," Musgrave told The Dodo. "What's remained a little bit more of a puzzle is figuring out how these different communities come to develop different tool behaviors, as well as how they pass on these skills to the youngsters." Musgrave and her colleagues documented this behavior by setting up camera traps at termite mounds in the jungle. 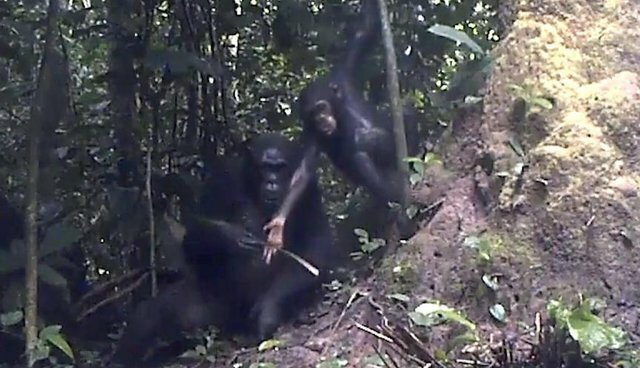 Then they analyzed the footage - they realized that the mother chimps were reducing their own foraging opportunities by taking the time to give their babies tools. In other words, the moms were getting the shorter end of the stick, while the babies got a bigger benefit. The mother chimps' actions met the scientific criteria for teaching in wild apes. While it's great to have more scientific evidence of chimp intelligence, it's also not surprising. A captive chimp named Bouboule was recently seen making a "purse" out of leaves to carry her snacks. Another captive chimp named Montaro adopted her friend Soona's baby after Soona died from childbirth, despite being heavily pregnant herself. But it's great that we're getting closer to understanding - and appreciating - the highly intelligent and socially complex chimpanzee, who's said to be the closest relative to humans. "Studying and observing great apes is extraordinary, and I think that for other people to hear these results is very compelling," Musgrave said. "It can tell us something about our closest living relatives, and it can give us insight into them."